Starring Patrick Stewart, Hugh Jackman, Halle Berry, Ian McKellen, Famke Janssen, Anna Paquin, Kelsey Grammer, Rebecca Romjin, James Marsden, Shawn Ashmore, Aaron Stanford, Ellen Page, Bill Duke and Big Chris. I saw X-Men: The Last Stand at the gloriously restored Pic Theater ((I’m taking some liberty with the word “gloriously” here. There was a fire at the Pic a couple of years after I graduated from high school, and the theater was closed for a while. I don’t believe the theater was modernized at all during its renovation/restoration/repair; the theater is almost entirely unchanged since I saw Bram Stoker’s Dracula there three times back in 1992, except that the balcony is now closed.)) in Hancock, Michigan with my wife and two of my siblings. The Pic is a very humble theater, a single-screen relic with no stadium seating, digital projector or THX-certified surround sound. Across the Portage Canal, the Pic’s sister theater, the Lode, now sports three screens and, up the hill at the Copper Country Mall, Carmike Cinema has five. None of these theaters rival the Cinemark or Regal multi-plexes scattered across northeast Ohio, but the Pic is the last place I would have expected to see the first of the so-called summer blockbusters. As it turns out, the venue in which X-Men: The Last Stand was playing was the least of my worries. Like an unstoppable juggernaut, the creative forces behind the film had trampled the franchise underfoot leaving only devastation and ruin in their path. If only Bryan Singer hadn’t been too busy directing Brandon Routh’s spit-curl in Superman Returns, maybe he could have spared me this pain. Alas, our Memorial Day vacation has come to an end. Laura, Kyle and I have returned from Upper Michigan and are reluctantly resuming our normal, non-vacation activities. Photos and anecdotes (along with a review of X-Men: The Last Stand) to follow. One thing that I got out of this vacation is a serious case of digital camera envy, thanks to brothers Adam and Keven and Aunt Susie. Adam has a Panasonic TZ1, which is right up my alley. It’s small, fast, has a brilliant LCD screen and takes very nice photos (and Quicktime movies). Keven and Susie both have cameras (Canon and Nikon, respectively) that are a bit out of my price and skill ranges. Then again, they both make money taking photos, so their equipment is a bit beyond what Joe Snapshot and I use. Keven has lenses for his camera that rival the Hubble Telescope in size and can take pictures through walls. 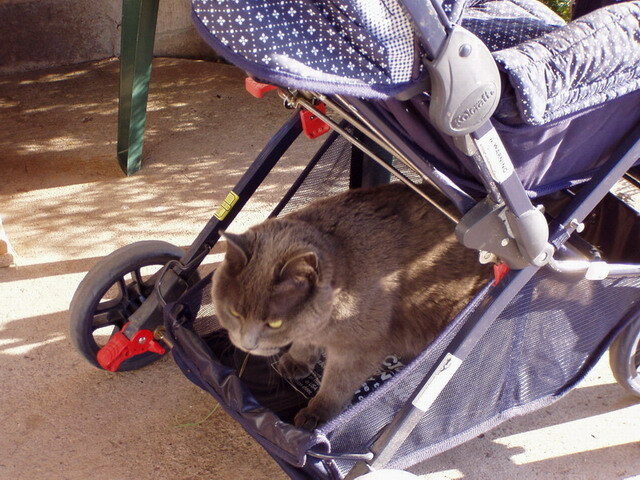 Just so you’re not left empty-handed, here’s a picture of my mother’s cat, Midgie, who decided that the lower deck of Kyle’s stroller looked pretty comfortable. As much as it may appear that Midgie is depositing a little something special for us, I assure you that is not the case. As is often the case with cats, Midgie realized just prior to the picture that she was doing something incredibly cute, so she decided to move. This picture was taken with my mother’s camera, which is an Olympus something-or-other. It’s a fine camera, but doesn’t make our HP PhotoSmart look like an Etch-a-Sketch quite the same way the Panasonic TZ1 does.